Cross rib steak is another name for shoulder steak, London broil or chuck steak. Lean beef such as cross rib steak provides protein without a lot of extra fat. This less-expensive cut of beef has less fat marbling than more expensive cuts of meat and requires careful cooking to keep it from becoming tough. Properly prepared, the cross rib steak can be flavorful and tender. Marinating your steak will make it more tender and juicier, whatever cooking method you choose. Add flavor without a lot of extra calories with a marinade that combines seasonings such as garlic, pepper and oregano with acids such as lemon juice, vinegar, soy sauce, tomato juice or wine. A couple of tablespoons of olive oil will add flavor and a healthy fat. Mix the marinade, then pour it over the steak in a plastic bag and refrigerate for a few hours or overnight. Cook the steak and discard any remaining marinade. Braising is a method of cooking meat over low heat in a liquid. The liquid keeps the meat from drying out and the long cooking time breaks down tough fibers in the meat. The result is a tender, juicy meal. Brown the steak on both sides in a little oil, then cover with the cooking liquid of your choice such a beef stock, tomatoes, red wine or a mixture of all of these. Add spices to taste and simmer, covered, for 90 minutes or until fork tender. Keep the temperature just below the boiling point. Boiling the meat vigorously can make it tough. Broil or grill your cross rib steak over medium high heat. Oil the broiling pan or grill to keep the steak from sticking. A marinated steak will remain juicy when cooked this way, provided you don't cook the steak too long. Don't cook past medium rare, to avoid a tough steak. 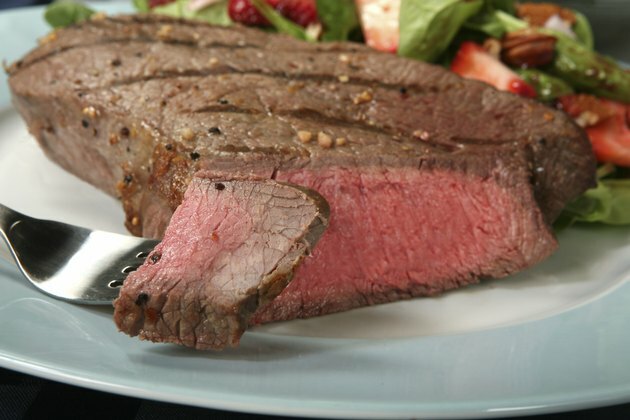 Slice the steak thin across the grain for classic London broil or to serve in a steak sandwich or a steak salad. After marinating a cross rib steak, you can slice it into small pieces and chunks and use these in stews, soups or stir-fries. Marinating tenderizes the meat and cutting the meat into pieces helps it cook quickly. Don't overcook the stir fry; stop when meat is still a little pink in the middle. Stewing the meat serves the same purpose as braising, combing lots of liquid with a slow cooking time to tenderize the meat. Can You Slow Cook Filet Mignon?